Back in January, I argued that re-signing Andre Blake was not the best long-term decision for the Philadelphia Union. I’ll be the first to tell you that right now, as the Union sit in 5th place in the Eastern Conference in September, it’s a little bit harder to argue that point. Blake’s been spectacular. He is third in Major League Soccer with 99 saves. He blocks almost 70 percent of the shots on frame he faces. Of the 41 goals he conceded this year, seven have been penalties. You can either say none of those are his fault or that he should save a couple, but the fact remains he’s arguably the league’s best goalkeeper. Most of us are not surprised by that. Still, only some of that column was about Blake. I admitted he was dominant and simply questioned the move from a financial standpoint. It wasn’t that it was a poor decision to sign Blake long term — I just wanted to throw a couple of other options on the table. One of those options was John McCarthy. I said this in the above piece and I’ll say it again: McCarthy is nowhere near as good as Blake. I’m not going to be naive about that, but I also want to look a little closer at the backup because I’m not sure he gets all the credit he deserves. Now, it helps that he’s a homegrown and by all accounts an all-around great guy, but being from the area doesn’t grant you anything. Being a fan-favorite doesn’t automatically grant you a five-year stint as a professional soccer player. The bottom line is he’s very good. In eight matches for the Union in 2017, McCarthy made 34 saves and produced four results (two wins). One of those was a clean sheet and that’s about all you can ask for considering Philly finished 8 points off a playoff spot. He has three MLS clean sheets total, and while that looks like a small number next to Blake’s 25, it’s not that far off percentage wise. In other words, give John McCarthy another 7,000+ minutes in goal, and he’s on pace to have almost as many clean sheets as Blake. He hasn’t made any MLS appearances this season, but has two clean sheets for the Union — one in an international friendly vs. Eintracht Frankfurt in July and one against Richmond in the U.S. Open Cup in June. Say what you will about the competition, but McCarthy has proven that he could be a successful MLS goalkeeper. That’s part of why it’s been kind of a bummer watching McCarthy play for Bethlehem Steel this season. It’s not that I don’t enjoy watching him play (quite the opposite), but rather I feel like he’s a bit too big for the stage. He’s made just 11 starts for the Steel this season and has three clean sheets. It doesn’t sound like anything remarkable, but keep in mind his back line is constantly changing and he has very little sense of continuity in that role. He’s also made 37 saves, good for 28th in a 33-team USL despite the minutes, and I can tell you that a lot of them have been impressive. He’s the kind of guy that just gets the job done and doesn’t make mistakes. What if the Union didn’t t re-sign Blake in the offseason? What if he (deservedly) went over to a big club in Europe and moved on? 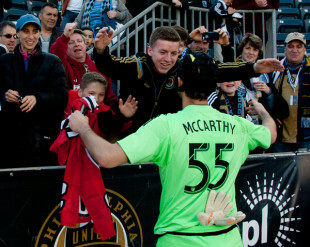 Does Philly splash cash for another keeper or do they give McCarthy a chance? I’d argue he’s at least earned a chance. If he starts all the MLS matches this season, do the Union have fewer points? Probably. But what if the Blake money was used in the attack and it turned into more goals? How much worse off would the club actually be? It’s all speculative, of course, but you have to feel for McCarthy because he’s probably not going to get that chance — not here, anyway. Blake is here to stay and he might get injured or go out on duty with Jamaica, but he’s the guy. We’ll see McCarthy in a Union shirt moving forward, but only a bit. So, while part of me wants McCarthy to stick around and play for his boyhood club, another part hopes he gets a chance elsewhere someday. A proper, starter-in-MLS chance. Because the other portion of this is he’s only 26. He’s younger than Blake and has a lot of years ahead of him at keeper. It would be a shame if he were a back-up for most of his career. It’s obvious that most Union supporters are happy with Blake, but you have to wonder what McCarthy’s path looks like if Blake’s not in the picture. Really like John as a player. And totally agree he has earned his chance to be a starter. Union Academy pipelining some keepers soon too I bet. 1. There will be an expansion draft for FCCincinnati right after MLS Cup, if past practice continues. It is doubtful the Union would protect two goal-keepers. 2. The change in goal-keeping coaches last offseason has changed how the keepers have been used in 2018. Either Kris Shakes or Tomas Romero have been the backups at Bethlehem. Neither has seen a minute in the pitch. The new approach has given all the game time to the top three, and the Union’s lack of games during the international windows in September and October means there is no need to give chances to a fourth. Shakes and Romero have both played their Minutes with the Academy. And do not forget the name Matt Freese, currently at Harvard who played at Episcopal Academy and with the Union Academy. Always liked McCarthy, and as a shot stopper, he is damn close to Blake’s level. His distribution was always a bit suspect, but that is something you can always improve… especially with a more cohesive team in from of you. GK’s usually have long careers, and if Blake keeps it up, the Union will have to sell their most prized (right now at least) asset for a profit at some point. I do think McCarthy will get his chance and as a hometown boy (I do agree it doesn’t grant you anything) – I would love to see it be here. Also, he grew up like 3 blocks from where I did (in Mayfair – Philly – I think he moved to NJ at some point though) so LOCAL BOY MAKE GOOD! Completely DIS-agree about McCarthy. While he is a tremendously nice young man and always quick with a smile, or to take a fan photo, that makes him a great comparison for Phang, not an MLS quality GK. The most robust defenses I’ve seen mounted for him so far usually involve a guy whose kids have had pictures taken with McCarthy, not a guy who can actually articulate where a proper GK should be in his space in various situations. Nothing in McCarthy’s performance history indicates he is or has ever been, worthy of being part of an MLS 18. He has a very well documented history of being slow to react compounded by an inability to recognize where he’s supposed to be positioned based on the flow of play in front of him. During the team’s whole 2015 GK debacle, Brian Sylvestre, the “MLS emergency loan” from the Railhawks, got the bulk of the summer starts because he showed a lot more quality between the pipes. Go back and look at the 2015 comments, most people were were recognizing Sylvestre’s far superior play (despite a pretty bad/dysfunctional team). I will admit, from what little he’s played this season, McCarthy’s distribution appears to have improved a notch (it no longer looks like there is a hair fire going on underneath his helmet). I get that everyone wants to love the “local boy/Rocky” angle here, but too many folks have let that get in the way of objectivity (unless you’re talking Jim Curtin). I’d be happy to give McCarthy the benefit of the doubt if he was just the victim of a bad defense in front of him, but if anyone ACTUALLY takes the time to go back and dig up the recordings of the goals he’s given up, you will see a long series of seriously bad goals that would have been stopped by any decent GK. McCarthy moving on will have a far more positive impact on this team’s results than if he actually makes it onto the field again. Did you watch McCarthy at all last year. He improved tremendously for the previous years. The man without a doubt belongs on an MLS bench at least. His distribution and organization had some whispering last year that we could safely move on from Blake. Now don’t get me wrong, Blake is a much better keeper and has improved every year, but lets not rip McCarthy because he is behind a great player.